Last night saw the opening of LA graffiti artist RETNA's Hallelujah World Tour in London and we at Hookedblog headed over to see if the show lived up to all the hype. 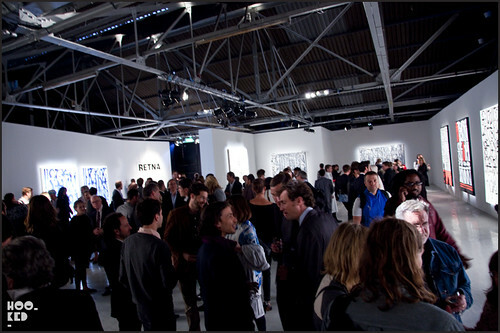 The private view was held in the vast Old Dairy popup space in Bloomsbury tucked away in a little side street. Having previous hosted the Richard Hambleton exhibition back in November we were familar with the space and it's location on Wakefield street which is just as well as out apologetic black cab driver didn't know where the street was! 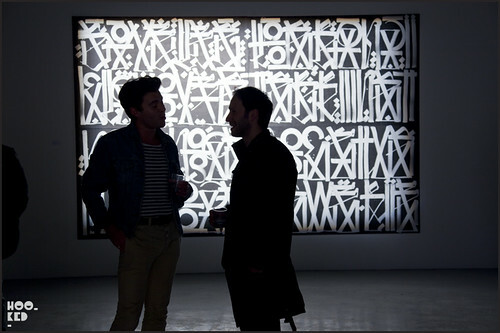 The show certainly did not disappoint, the vast space was packed with RETNA's large scale works on canvas, paper and and various metal objects. We were a little skeptical but the stunning brush work in some of the pieces certainly justify all the hype this artist and his work has been receiving. The evening saw the London art crowd in full attendance along with London socialites, super models and fashion designers all making for a very flash evening. The show is running until the end of the month and we suggest you do not miss the opportunity to experience this work in person. Below are a selection of photos we took last night.